What does raised underfoot mean? With respect to cats, it means that kittens breed by a breeder have been properly socialized by ensuring that during the 2-7 week period of their lives they have been free to roam around the house, under the feet of the breeder and her family. In this way the kittens become used to being in contact with people and other pets including dogs and visitors. This is a vital phase of the kittens’ lives. Without it when they become adults they will be far less likely to have pleasant personalities from a human standpoint. Kittens need to lose any fear they might have of people. It does not come naturally. They have to be ‘trained’ to be relaxed around people. This training is called socialization. 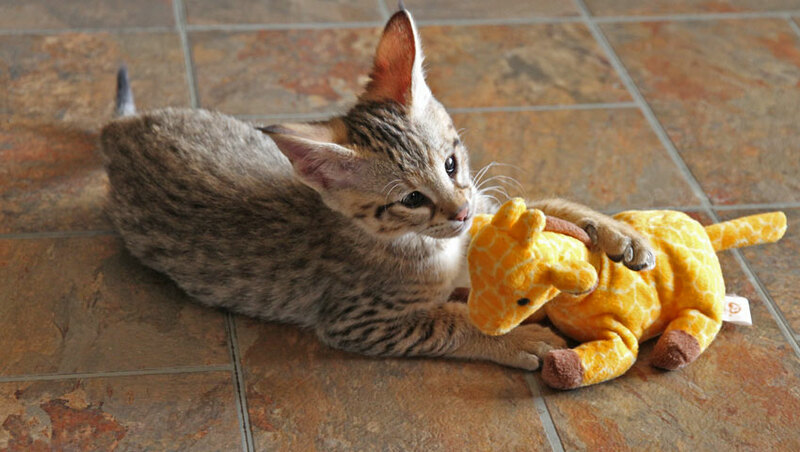 f2 savannah kitten with plush toy. Underfoot! True feral cats don’t experience these priceless moments of being in contact with people and pets which is why they run from them in fear. They are wild. Socialization changes a cat from wild to domestic. It’s about habituating young kittens to the presence of primarily people of all kinds. Serval and F2 Savannah play at A1 Savannahs’ house. They were underfoot. What does raised under foot mean? In one word it means socialization. I clearly remember spending many happy days at A1 Savannahs where they still breed Savannah cats of a range of filials and servals (the wild cat component of this wild cat hybrid). Ownership changed years ago though from the Stuckis to a person who likes to kill animals. In their house you’d find F1 and F2 Savannah cats playing and roaming around the living room and attached swimming pool. This was raising cats underfoot. How Do I Socialise My Adult Cat? Ironically and tragically on one occasion a visitor – I think it was a builder – walked on a kitten and killed him. Utterly tragic and expensive. He was worth thousands of US dollars. This was definitely underfoot – literally. You have to take precautions when raising kittens underfoot. They are very small and prone to actually being under your feet. Also furniture can be a hazard. Recliners can kill kittens who climb into the mechanism. Never buy a recliner if you are raising kittens underfoot. It is a bit strange but a friend of mine asked me the other day: “What does raised underfoot mean?”. It prompted me to write this post. This entry was posted in socialisation and tagged cat socialisation, domestication, early domestication of the cat, recliners, socialisation by Michael Broad. Bookmark the permalink.